The 1973 St Jarlaths Senior Hurling team were heroes and legends in our eyes, and our collective dream was to emulate their historic and groundbreaking achievement. Eight points down with three minutes to go against the might of Presentation College, Birr, they had staged a Lazarus like comeback with three late goals to secure their place in the history books for time immemorial. The man who orchestrated the miracle was my English teacher and Drama Director of some renown, Joe Joe Donoghue and he was more than happy to reminisce about their extraordinary exploits when I broached the subject during one of our classes. Ten years on, I knew we had a talented pool of players, including Salthill midfielder Michael Quigley (who would play minor for Galway in 1984), Galway legend P J Qualter’s two sons Seamus and Paul from Turloughmore, the Fahy brothers, Joe and Martin from the Padraig Pearses club in Gurteen/Ballymacward, our captain Niall Cullinane and Barry Kearns from Athenry, Tommy Devane from Abbeyknockmoy, Loughrea’s Xavier Slevin and Rory Boland from the Oliver Plunketts Club in Dublin. These lads were years hurling for their clubs and it showed in their style of play. They had a cutting edge (which I was still trying to develop) and could achieve great feats of skill in an instinctual, spontaneous way, whenever the pressure came on in a competitive fixture. I used to marvel at the latter, happy in the knowledge that it was a great privilege to be on the same team as them. I took greater inspiration however from the guy who played on the same wing as myself at top of the left. His name was Pearse O’Donoghue and he hailed from the Gaelic football stronghold of Dunmore. Unlike myself and other lads from non hurling areas, Pearse was as valuable to the team as any of the aforementioned lads. He could hurl with the best of them because he had no sense of inferiority, believed totally in his own ability and could invariably deliver the goods in a tight match when it really mattered. My fellow parishioners Peter O’Toole from Ballinakill, James O’Neill from Glencroft and Leenane’s John Feehan completed the West Connemara contingent in the squad. 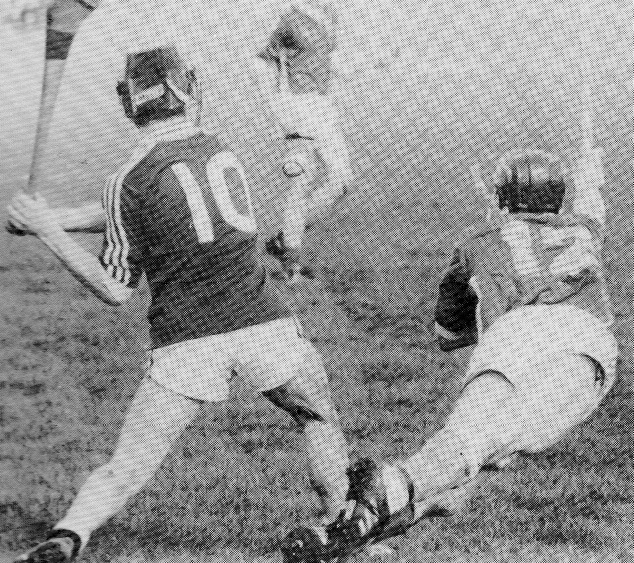 A classic action shot of St Jarlaths wing forward Gerry Gannon as he endeavours to block the shot of his Presentation College, Athenry, opponent during the 1991 Connacht Senior B Hurling Championship final. Photo courtesy of Torch Magazine. SJC entered three senior hurling competitions that year, namely the Connacht Senior B Championship, the Connacht Senior B League and the Regan Cup which was a Senior B competition that included vocational schools. Victories over St. Cuans, Castleblakey in the League final and later Father Griffin Road Vocational School in the Regan Cup Final set us up perfectly for an all out assault on the Championship in the spring of 1984. There were only two teams in the A grade that year, namely, Garbally College, Ballinasloe, and Gort Community School, and after we defeated the latter in a challenge match down in Gort, we really believed we could complete the treble. The panel was large and competition for places was intense. We inflicted a heavy and historic defeat on St Marys College, Galway, on their own pitch in the First Round. Next up was Roscommon CBS in the Quarter Final. It was a brutally tough encounter but we scraped through in the finish, thanks to a moment of magic from our most talented player Paul Qualter. He engineered a brilliant goal out of nothing to get us out of jail with only a few minutes remaining. For the first time all year that I had failed to contribute on the scoreboard but I still assumed that I would be in the starting line up for our impending semi final against St Raphaels, Loughrea, in Pearse Stadium. When I found out subsequently that I’d been dropped, I was devastated. We hammered Raphaels and I was introduced as a substitute late in the second half, but my confidence was completely shattered and I was totally ineffective. I tried to redeem myself subsequently on the training ground in the run up to the Connacht Final, but the psychological impact of my sudden and unexpected demotion was severe and I failed to get selected. The Connacht Final against a hotly fancied Athenry was played on a Friday afternoon in Pearse Stadium and on a personal level it turned out to be a day of mixed emotions. On one level I felt elated because we won the match but I was also in the depths of despair because my father had travelled all the way in from Renvyle and I knew in my heart and soul that he wouldn’t get to see me play. The match itself was a real nail biter and the lads put in a storming finish to sicken the huge Athenry support (SJC had absolutely no support on the day because the college authorities insisted that everyone had to attend class) but I had been surplus to requirements and felt somewhat detached from the whole achievement. We were drawn against the might of Castlecomer CBS from Kilkenny in the All Ireland Semi Final and the match was played in Tullamore. I trained like a demon and tried really hard to find a new level of intensity in my hurling in a failed attempt to make the starting line up. The week before our match was played, Ulster Champions, St. Patricks, Maghera from Derry, shocked the Munster Champions, Scariff from Clare and booked their ticket to Croke Park. The Senior A footballers of St Jarlaths had already captured the Hogan Cup with a dramatic one point victory over St Patricks, Maghera in Croke Park and now their hurling brethren had just been presented with a wonderful opportunity to secure a unique double for the college at the same venue. The 1984 All Ireland Senior B Hurling Championship Semi Final between Castlecomer CBS and St Jarlaths College, Tuam, was a real thriller. The Kilkenny lads had the edge all through in craft and guile but we had the heart, the desire and the sense of destiny. Superb individual goals by Michael Quigley and Pearse O’ Donoghue at key moments in either half kept us in it right to the end. However, a converted 65 in injury time ultimately secured the victory for the Cats and our dream of gracing the hallowed turf at Headquarters, died a bitter death. Castlecomer went on to win the All Ireland by ten points. Remembered and written by Paul Gannon. Paul Gannon, a native of the townland of Derryherbert, is a permanent resident of the townland of Cloonluane, on the Renvyle Peninsula, in the Parish of Letterfrack-Ballinakill.